GM 462 (Collector Grzegorz Matuszewski) Locality: Ojo Caliente, 2060m. at: Rebutialand - Cactus collection - Hungary. Habitat and ecology: On lower slopes of volcanic hills under bushes, agaves and hechtias. Aulacothele raphidacantha ancistracantha (Lem.) Monv. Coryphantha clavata var. ancistracantha (Lem.) Heinrich ex Backeb. Mammillaria raphidacantha var. ancistracantha (Lem.) K.Schum. Mammillaria rhaphidacantha var. ancistracantha K.Schum. Coryphantha clavata var. radicantissima (Quehl) Heinrich ex Backeb. Description: Coryphantha ancistracantha is a solitary cactus species with very large root and long hooked spines. It is generally included within (as a synonym of) Coryphantha clavata subs. stipitata, suggesting that there is not really a fundamental difference between the two, and hard to name accurately without knowing where they come from. Coryphantha clavata subs. stipitata displays 1 (seldom - 4) central spines always with a hooked tip. The flowers are nearly white and slightly larger (30-35 mm diameter) than in ssp. clavata. All the other characteristics are identical to ssp. clavata. Taxonomic notes: Coryphantha clavata subs. 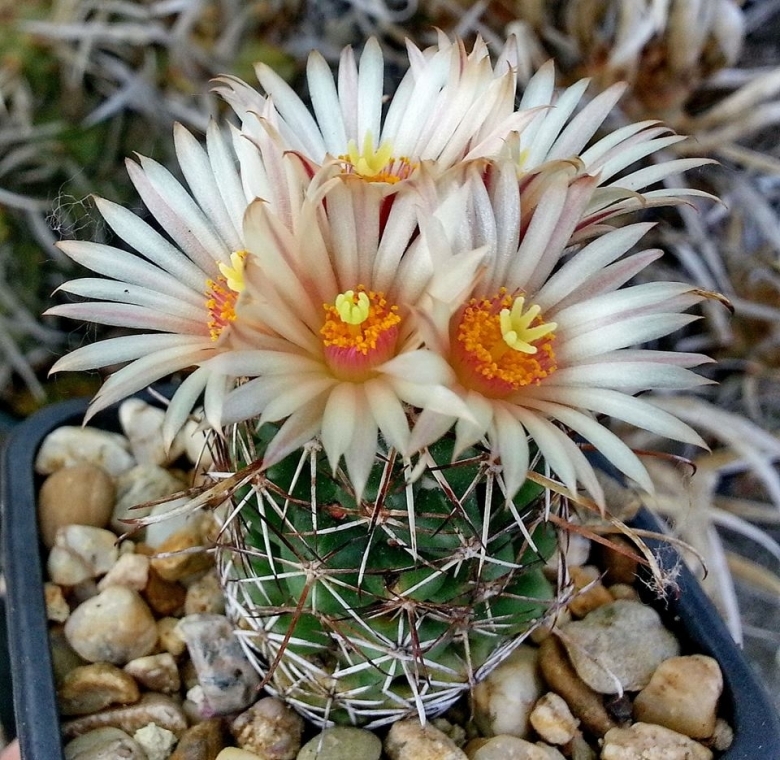 stipitata was first described by Scheidwwiler (1838) as Mammillaria stipitata, one year later by Lemaire as Mammillaria raphidacantha and also as Mammillaria ancistracantha. The distribution areas of ssp. clavata and of ssp. stipitata are always disjunct, they occur nowhere together. Stem: Simple, elongated to club shaped, cylindrical, 10 to 15 cm tall, dark bluish green. Tubercles: In rows of 5-8, and 13, conical, grooved above, the axils when young bearing short white wool; glands in the groove.one to several, large, red. Radial spines: 6 to 12, with reddish or black tips. Central spine: 1 (rarely 4) , somewhat longer than radials, straight or curved (subsp. clavata) or hooked (subsp. stipitata). Flowers: Small for the genus, about 20-30 m in diameter (subsp. clavata) or 35-40 mm in diameter (subsp. stipitata); outer perianth-segments linear, acute, entire, with broad brownish midrib; inner perianth-segments linear, entire, narrow, creamy white; stamens pinkish, much shorter than the perianth-segments; style pinkish; stigma-lobes 5 or 6, short, greenish. Coryphantha clavata (Scheidw.) Backeb. : (subsp. clavata) Central spine straight or curved. Flowers 20-30 m in diameter. Distribution: Aguascalientes, Guanajuato, Hidalgo, Jalisco, Querétaro, San Luis Potosí and Zacatecas. Coryphantha clavata subs. stipitata (Scheidw.) Dicht & A.Lüthy: Central spine always hooked. Flowers 35-40 m in diameter. Distribution: Zacatecas, Guanajuato, San Luis Potosi and Jalisco, mainly around Lagos de Moreno.